There are two kinds of solubility measurements that are typically obtained in drug discovery: kinetic solubility (i.e., non-thermodynamic solubility) and equilibrium solubility (i.e., thermodynamic solubility). The differences between the two solubilities are summarized in Table 1. Table 1. Comparison of Kinetic and Equilibrium Solubility compound using Beer's law. Precipitated solid material can be a mixture of meta-stable crystal forms, such as amorphous material and mixtures of different crystal forms. The crystal form of the precipitate is usually not characterized. In an equilibrium solubility experiment, the solid material, which is usually in a stable crystal form, is placed in contact with the solution until it reaches equilibrium. An equilibrium solubility measurement is performed by adding buffer to solid material, which is in excess. The solution mixture is shaken gently for 24 to 72 hours to come as close to equilibrium as is practical. At the end of this period, the solution is filtered to remove excess solid and the concentration of the filtrate is determined using LC-UV or LC-MS. There are several commercial integrated systems for solubility measurement (Kerns, 2001). Recently, in silico methods have become available to predict aqueous solubility (Jorgensen and Duffy, 2002). In silico methods are useful for evaluating screening libraries and for solubility predictions before compounds are made. Solubility is more difficult to predict accurately in silico than Log P or pKa. The two important factors that govern solubility are lipophilicity and melting point (Yalkowsky and Banerjee, 1992). Melting point is related to crystal packing energy, which is not well understood and hard to predict accurately. Reliable solubility data is largely dependent on experimental measurement, especially solubility-pH profile. Since most biological assays in drug discovery use DMSO stock solutions, kinetic solubility most closely mimics biological assay conditions in drug discovery, in terms of DMSO content, meta-stable crystal forms, target concentration, incubation time and throughput. Thus, kinetic solubility is most applicable for hit selection, lead selection and lead optimization. Kinetic solubility has many applications in drug discovery, such as: to provide an early alert for potential in vivo absorption issues, to help diagnose erratic bioassay or property assay results, to develop structure-solubility relationships, to select compounds for NMR-binding and X-ray co-crystallization studies. Formulation in drug discovery faces many challenges due to the limited amount of sample, short timelines, high dose, multiple animal species and multiple routes of administration. To assist in developing a compound formulation for in vivo dosing during drug discovery, early kinetic solubility information at different pHs can be used as input along with pKa and LogP, using a decision tree approach (Lee et al., 2003). Equilibrium solubility is very applicable for the later lead optimization and candidate selection phases. Equilibrium solubility provides detailed information to help diagnose in vivo results, aid formulation, IND filings and to help develop strategies for drug development. Equilibrium solubility of development candidates is typically determined in a wide range of solvents, including physiological buffers, formulary solvents and solvents that measure lipophilicity. An example of different solvents used for solubility determination of development candidates is shown in Table 2. It is commonly thought in the industry that high fat diet will increase solubility of lipophilic compounds and therefore enhance absorption. Food can affect oral bioavailability in many different ways (Zimmerman, et al., 1999). This is because food can either increase or decrease oral bioavailabity by delaying gastric emptying (prolongs absorption), slowing input into intestine (prolongs absorption), stimulating bile salt secretions (increases solubility of lipophilic compounds), altering the pH of the gastro-intestinal fluid (changes solubility), increasing blood flow (improve sink condition, faster metabolism) and increasing competition for metabolic enzymes (slows down metabolism). Different buffers have been developed to simulate gastric fluid conditions in fasted and fed states (Dressman et al., 1998). It has been found that solubility measured in gastric fluid gave better prediction for oral bioavailability than solubility measured in aqueous buffer alone, when permeability is considered (Aungst et al., 2002). A question that is commonly asked by discovery teams is: what is the minimum acceptable solubility for a development candidate? This relates to the dose. If all the administered drug is completely absorped, the dose is the "maximum absorbable dose" (MAD). MAD is a function of solubility and permeability (Johnson and Swindell, 1996; Curatolo, 1998). Assuming that MAD is the same as the target dose, the minimal solubility for maximum human absorption can be calculated using Equation (1) (Johnson and Swindell, 1996; Curatolo, 1998). Figure 1. Correlation between Solubility, Permeability and Dose the minimal acceptable solubility (Lipinski, 2000). However, if the compound is less potent, has a dose of 10 mpk and poor permeability, the minimum solubility needed is 2000 |g/mL, in order to achieve maximum absorption. On the other hand, if the compound is much more potent, with a dose of 0.1 mpk and high permeability, the minimum solubility needed is 1 |g/mL. Lipinski has classified the solubility ranges (high is > 60 |g/mL, moderate is 10-60 |g/mL, low is < 10 |g/mL) to provide a general guideline for achieving acceptable human absorption for compounds with average potency and permeability. This classification might not be suitable for animal dosing and it is different than the solubility classification ranges in the Biopharmaceutics Classification Systems (BCS). For example, for a 1 mpk I.V dose in rat with an ideal dosing volume of 1-5 mL/kg, the required concentration is 0.2 - 1 mg/mL. This is much higher than 60 |g/mL. Thus, for animal dosing, a "high" solubility classification for human might not be sufficient for preparing a dosing solution for rat. BCS is typically used for bio-waiver in drug development for in vitro and in vivo correlations. A "high" solubility requires that: 1) the dose divided by the solubility be less than or equal to 250 mL, and 2) 85% dissolution is achieved at pH 1-8 within 15 minutes. This is very different than the "high" solubility classification used as a guide in drug discovery. There is a pH gradient created throughout the length of the gastrointestinal tract, from acidic pH in the stomach to basic pH at the last portion of the small and large intestine (Dressman et al., 1998). Solubility-pH profiles are very useful for ioniziable drugs. Solubility at different pHs is described by the Henderson-Hasselbalch equation (Equation 2 for acidic compounds), where Stot is total solubility at a particular pH, and So is the intrinsic solubility of an acid in its neutral form. Intrinsic solubility is defined as solubility of the neutral species. An example is shown in Figure 2, which illustrates the contributions of intrinsic solubility and pKa. Compound A and B have the same pKa, but a different intrinsic solubility (Figure 2a). Compound A is more soluble than Compound B through the entire pH range, due to higher intrinsic solubility. Ways to increase intrinsic solubility include introduction of polar functional groups, hydrogen bonds and reducing MW and size. Compound C and D have the same intrinsic solubility, but a different pKa (Figure 2b). Compounds are much more soluble in their ionized state, suggesting that introduction of an ionization center is an effective way to increase solubility. Solubility increases exponentially with the difference in pH and pKa. Ways to increase solubility by introducing ionizable centers will be discussed in the next section. Figure 2. Solubility-pH profile. 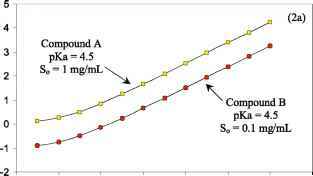 (2a) Compound A and B have the same pKa, but different intrinsic solubility. Compound A is more soluble than Compound B through the entire pH range, due to higher intrinsic solubility. (2b) Compound C and D have the same intrinsic solubility, but a different pKa. Compounds are more soluble in their ionization state. Salt forms usually will not change the equilibrium solubility of an acid or a base in pH buffers, but will change the dissolution rate. 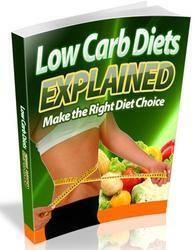 Salts increase absorption by increasing the dissolution rate. Salts typically have a time window during which their concentration is higher than their equilibrium solubility. This effect increases absorption. This is due to super-saturation and slow precipitation. Any precipitate tends to be amorphous material, which has higher solubility than crystalline material. A classic example is para-amino salicylic acid (PAS) (Wan et al., 1974). The absorption of the free acid is incomplete. Only 77 % is absorbed. The absorption of salts (Na+, K+ and Ca+) reaches completion due to higher dissolution rate and slower precipitation. Therefore, salt form approaches can be applied to discovery compounds that contain ionizable groups, in order to enhance absorption. Prodrug strategies to improve solubility are not very common, due to the substantial cost associated with prodrugs, including additional synthetic steps and complex development requirements. Nevertheless, there are some successful examples in the industry of prodrugs that improve solubility (Ettmayer et al., 2004). For example, phenytoin has a solubility of 20-25 |g/mL. The parenteral I.M. formulation is problematic. The phosphate prodrug, Fosphenytoin, has a solubility of 142 mg/mL, which is a 4400-fold increase in solubility. It has been successfully marketed as Cerebyx™ (Stella, 1996). Through the years, many state-of-the-art and cutting-edge technologies have been developed to formulate insoluble compounds. In drug discovery, we would like to solve drug delivery problems 'with covalent bonds', as stated very nicely by William Curatolo (1998). Some of the practical approaches to improve solubility through 'covalent bonds' are described in the following sections. showed that by improving properties, medicinal chemists can convert inactive compounds to highly successful drugs. Scheme 2 shows a series of antitumor agents (Milbank et al., 1999). The compounds with methoxyl substituents show good potency against a panel of tumor cell lines, but low solubility. The compounds were modified by introducing tertiary amines as ionizable centers. The solubility increased dramatically. At the same time, potency was maintained. It is interesting to note that the last two compounds in the table differ only on the position of the substituent (C6 vs. C7). The solubilities of the compounds are very different. This could potentially be due to the differences in crystal packing. It is a common phenomenon that the most active compound in vitro is not necessarily the most active compound in vivo. The example Scheme 3 shows that the 1st compound was very potent in vitro, but was inactive in vivo due to poor solubility (Al-awar et al., 2003). 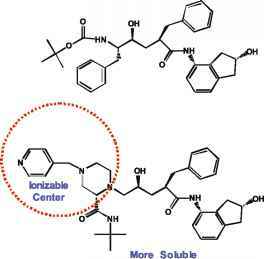 The 2nd compound was 5-fold less potent in vitro, but very soluble, due to the presence of the ionizable amines. The compound was very active in vivo. It is sometimes advantageous to improve properties at the expense of potency, especially when the compound series is very potent. Crystal packing is another important factor that governs solubility, in addition to lipophilicity. This is because compounds have to overcome the crystal packing force to dissolve in solution. Disruption of tight crystal packing can increase solubility. The example in Scheme 4 illustrates this strategy. By introducing an ethyl group in an area that is less critical for activity, it disrupted the u - stacking of the molecules and reducing crystal packing energy, as indicated by the lower melting point. The compound is much more soluble while retaining high potency (Fray et al., 2001). There are several transport mechanisms across the gastrointestinal membrane. Most drugs are absorbed through passive diffusion across the lipid bilayer membrane of the epithelial cells into systemic circulation. The process is driven by concentration gradient. The PAMPA assay is designed to measure passive diffusion through a lipid membrane. Paracellular transport requires that the compounds go through the junctions between the cells. The junctions are quite small, 3-10 A in diameter and negatively charged. The paracellullar pathway is usually limited to polar compounds with MW less than 200. There are also active processes, such as influx transport by amino acid or peptide transporters and efflux transport by Pgp or MRP. Substrates of influx transporters have special structural motifs such as sugars, amino acids and peptides. Efflux substrates are typically determined by using Caco-2 or MDR1-MDCKII assays. Endocytosis transports compounds in a vesicle. An example is the uptake of lipophilic vitamins.